Sarit Hadad, Yemima Mizrachi, to headline gathering. The Tomb of Machpela is the closest one can get to Sarah, the Matriarch of the Jewish people, and the annual "HaChi Krovot LeEma" event will aim to bring women spiritually closer. 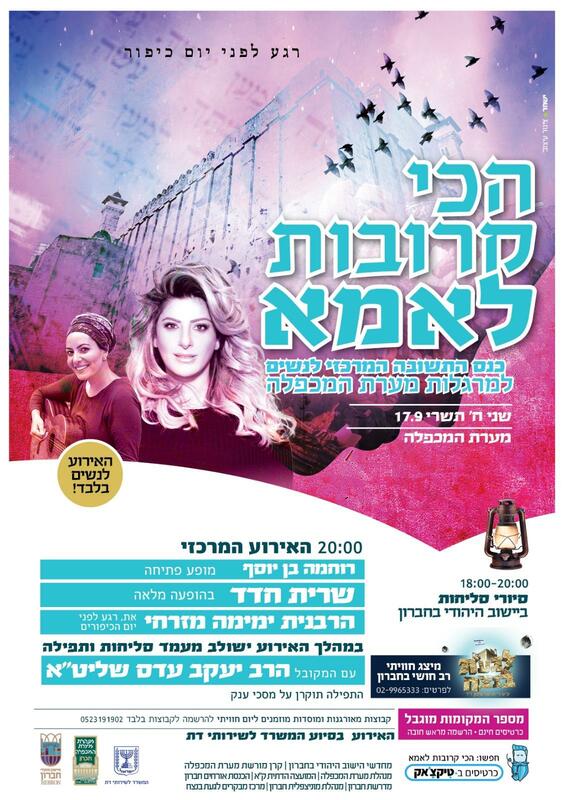 Sarit Hadad, one of Israel's most accomplished singers will return to Hebron for the event along with popular educator Rabbanit Yemima Mizrachi. Also performing will be singer and keyboardist Ruhama Ben Yosef. The uplifting, inspirational evening will take place during the Ten Day of Repentance just days before Yom Kippur and will be preceded by special slichot prayers held locally in Hebron. Free admittance. September 17, 2018. Performances and speeches will begin at 8:00 PM. For more information click here: https://tickchak.co.il/2619 or call 02-996-5333.